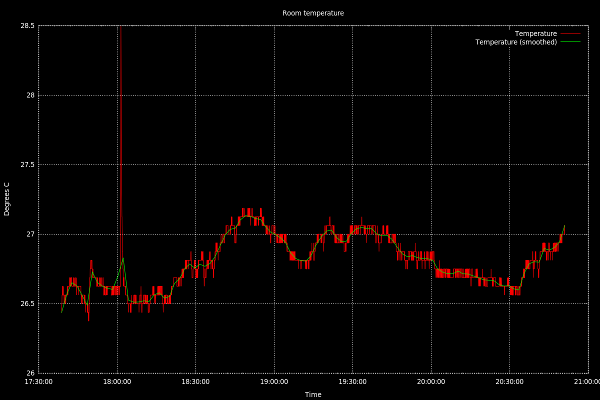 I wanted to do some temperature logging so I hooked up a DS18B20 temperature sensor to a Raspberry Pi. 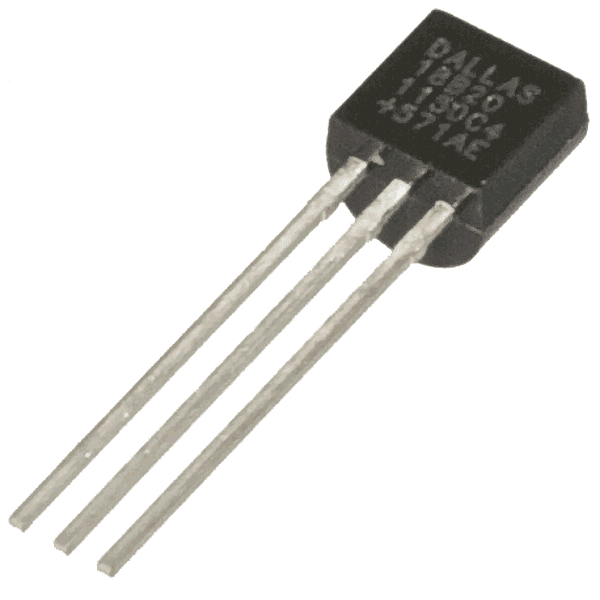 The DS18B20 is a temperature sensor that is nice and cheap and reasonably accurate (±0.5°C) and only uses 1 pin on the Pi for data transfer even when multiple sensors are used. The Rasbian distribution has built in support for the 1 wire protocol making it easy to get up and running. Here is a datasheet (from Maxim who now own Dallas) from this we can see we need to put a 4.7kΩ resistor between pins 2 and 3. Rasbian's built in support for 1-wire protocol is exposed on GPIO Pin 4 so this is where we need to connect pin 2 on the sensor to. Use the following diagram to wire everything up. 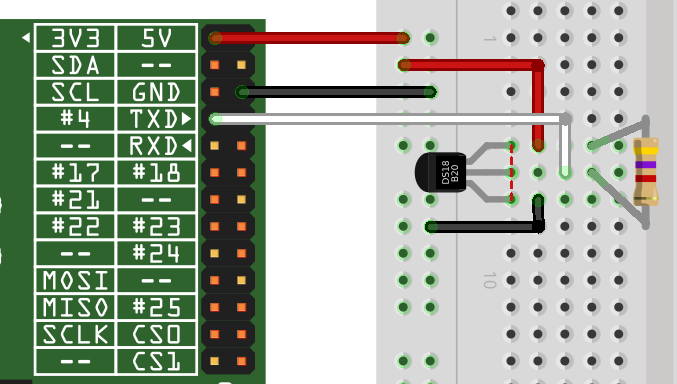 Connect pin 1 to GND, connect pins 2 & 3 with a 4.7kΩ resistor, connect pin 3 to 3.3V and then connect pin 2 to the Raspberry PI's GPIO pin 4. If the first line ends with "YES" then the temperature is available and it the value at the end of the second line. In this example the temperature is 2637 / 1000 = 26.375°C. Save the code to a file called something like read-temp.py make it executable with chmod +x read-temp.py and the run it with ./read-temp.py and it will display the current temperature. Try putting your thumb on top of the sensor and re-running the code and you'll see the value read has gone up. In my next blog I who how to add the LCD display to show the current temperature and how to log the data over time and produce a graph with gnuplot showing how the temperature has fluctuated.